This engaging new series of leveled biographies brings history to life one dramatic story at a time. By focusing on poignant moments as well as public triumphs, Amazing Americans makes paragons of American history feel accessible and real. When he was only 13 years old, Andrew Carnegie immigrated to America from Scotland. His father was out of work. His family was in need of money - and fast! Without it, they would not survive. Soon after the family's move to America, Andrew took a job in a textile mill to help support his family. Little did Andrew know that this job would be his first step on the ladder to success. 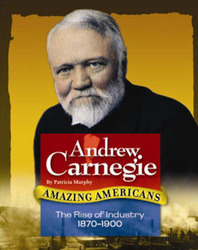 Learn how Andrew Carnegie rose from the textile mills of Pennsylvania to become the first "man of steel" and one of the wealthiest and most generous men in the world.